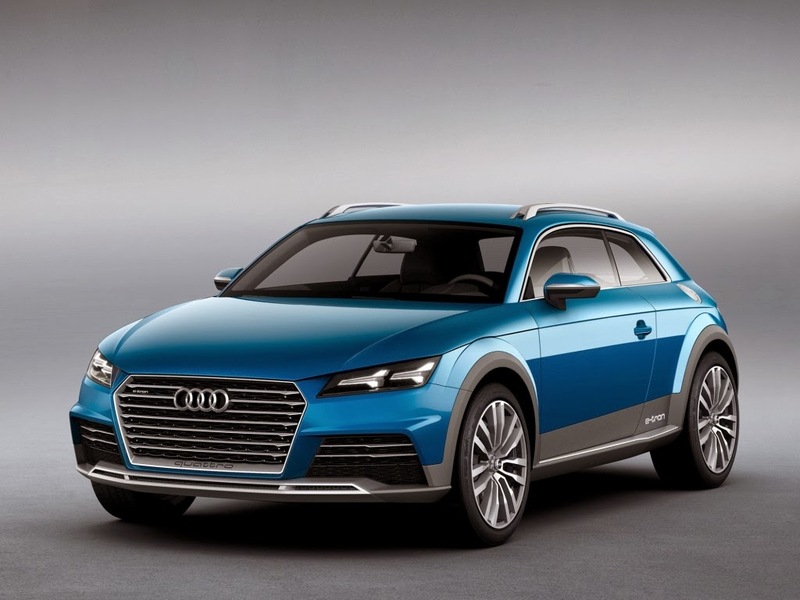 The Audi Allroad Shooting Brake has been revealed ahead of its motor show debut in Detroit. The compact crossover plug-in hybrid has a low fuel consumption figure of 1.9 liters of fuel per 100 km (123.8 mpgUS), equivalent to 45 g CO2 per km (72.42 g/mile) based on the relevant ECE standard. Its total driving range is up to 820 km (510 miles). The plug-in hybrid drive delivers impressive performance with 300 kW (408 hp) of system power and a system torque of 650 N·m (479 lb-ft). The show car, which weighs around 1,600 kg (3527 lb) without the driver, accelerates from 0 to 62 mph in 4.6 seconds, with a top speed of 250 km/h (155.34 mph). 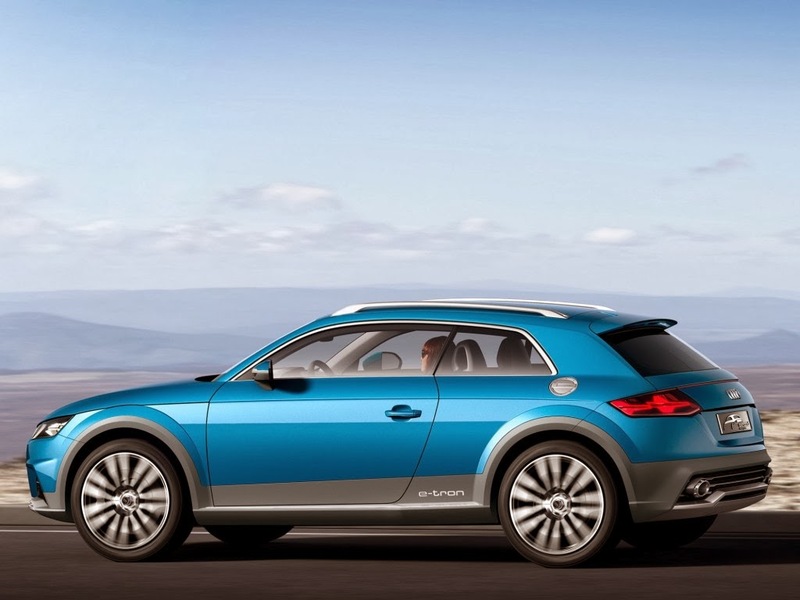 The 2.0 TFSI engine in the Audi allroad shooting brake outputs 215 kW (292 hp) of power and generates 380 N·m (280 lb-ft) of torque. The transverse mounted two-liter four-cylinder with a large turbocharger is a high-end engine. In part-load operation, indirect injection supplements direct gasoline injection to improve fuel economy; the exhaust manifold that is integrated in the cylinder head enables high-performance thermal management. The 2.0 TFSI operates together with a disc-shaped electric motor via a decoupling clutch; the electric motor outputs 40 kW of power and 270 N·m (199.14) of torque. It is integrated in the six-speed e-S tronic. The dual clutch transmission, which shifts at lightning speed, sends torque to the front wheels. A second electric motor, which is separate from this drive unit, is mounted to the rear axle. It supplies propulsive power at low and moderate vehicle speeds with its maximum power of 85 kW and 270 N·m (199 lb-ft) of torque. It can also be operated in tandem with the motor and engine at the front axle if the hybrid management system decides that all-wheel drive makes sense. In such situations, e.g. 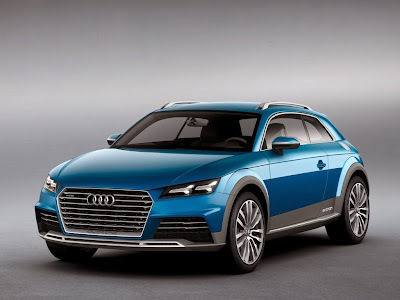 on a slippery road or in light off-road conditions, this essentially makes the Audi allroad shooting brake an e-tron quattro. Located just forward of the rear axle is a lithium-ion battery that consists of eight modules. It contributes towards a balanced distribution of weight, and it hardly affects cargo capacity at all. The liquid-cooled battery has an energy capacity of 8.8 kWh, which is enough for 50 km (31 miles) of all-electric driving. An Audi wall box is used for stationary charging; it can operate with different voltages and plug connector types, and it regulates the energy transfer conveniently and intelligently. In pure electric drive mode, the rear motor can propel the car up to 80mph, while the battery can power the car for 31 miles. A hybrid mode lets the engine and motors work together as efficiently as possible, permitting the front motor to top up the lithium-ion battery when required. This generator function means that the pure electric range can be replenished, which would allow for multiple stints of all-electric driving on a long enough journey. There are ‘Hold’ and ‘Charge’ settings within Audi’s redesigned MMI infotainment system that allows the driver to choose how the battery’s charge is managed. Hold mode will keep the battery at its current state of charge, while Charge mode will replenish it until it is full. The final drive mode is Sport, which combines the petrol engine and both motors to give a total power output of 300 kW (408 hp) of system power and a system torque of 650 N·m (479 lb-ft). The car is speed limited to 155 mph.